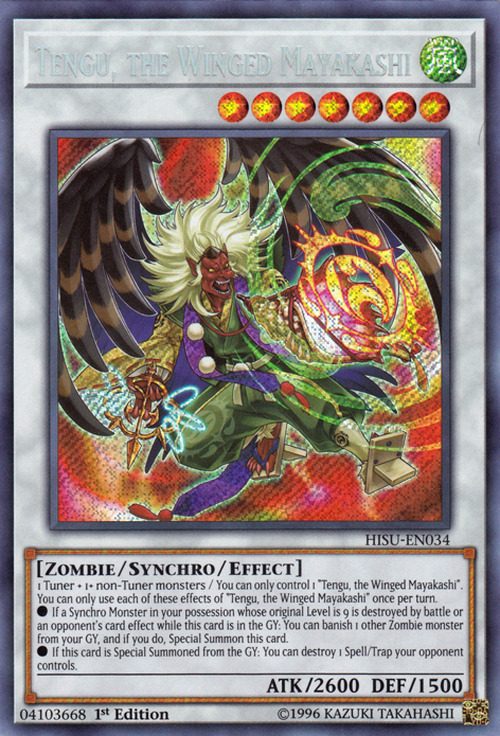 You can only control 1 “Tengu, the Winged Mayakashi”. You can only use each of these effects of “Tengu, the Winged Mayakashi” once per turn. ● If a Synchro Monster in your possession whose original Level is 9 is destroyed by battle or an opponent's card effect while this card is in the GY: You can banish 1 other Zombie monster from your GY, and if you do, Special Summon this card. ● If this card is Special Summoned from the GY: You can destroy 1 Spell/Trap your opponent controls. This monster is based on the Tengu (天狗, heavenly dogs), a class of supernatural creatures found in Japanese folklore, art, theater, and literature. Although they take their name from a dog-like Chinese demon (Tiangou), the tengu were originally thought to take the forms of birds of prey, and they are traditionally depicted with both human and avian characteristics. The earliest tengu were pictured with beaks, but this feature has often been humanized as an unnaturally long nose, which today is widely considered the tengu's defining characteristic in the popular imagination. 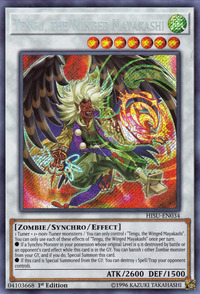 This monster is the Synchro counterpart of Hajun, the Winged Mayakashi.